If the plan is to replace existing pull handles with new ones, be sure to measure the distance between holes to make sure the swap requires nothing more than a screwdriver. Better yet, take the old hardware with you when you shop. 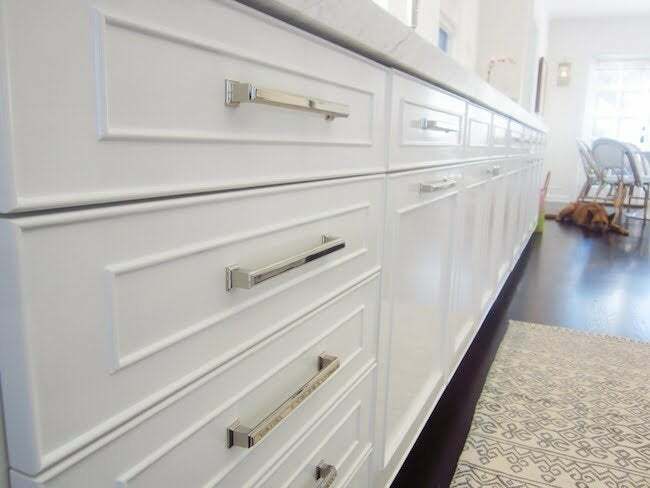 Always consider the finish on the hinges when choosing new cabinet knobs and pulls. Decorative pendant pulls in an oil-bronzed finish will not look as “decorative” if paired with chrome hinges. If you decide to paint unfinished knobs, don’t be afraid to experiment with colors and finishes. For a bright, cheery kitchen or bath, consider a pop of color. For a more subdued look, match the cabinets. Be sure to choose an enamel paint finish for high-traffic wear and tear. Be sure to take into account fashion and function when shopping for cabinet knobs and pulls and handles. Consider the shape, size, and scale and how the design works for you. The hardware should fit easily in your hands, and the grip should be comfortable.